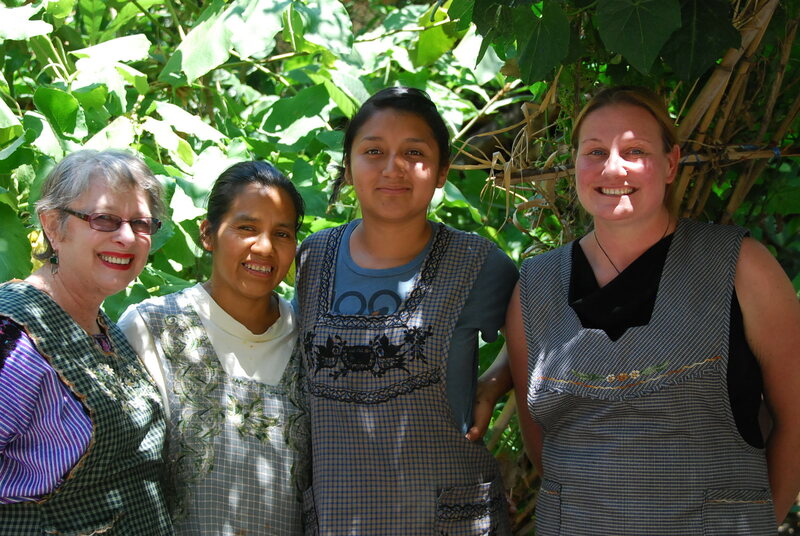 We are in the garden at Las Granadas Bed and Breakfast in Teotitlan del Valle, Oaxaca. 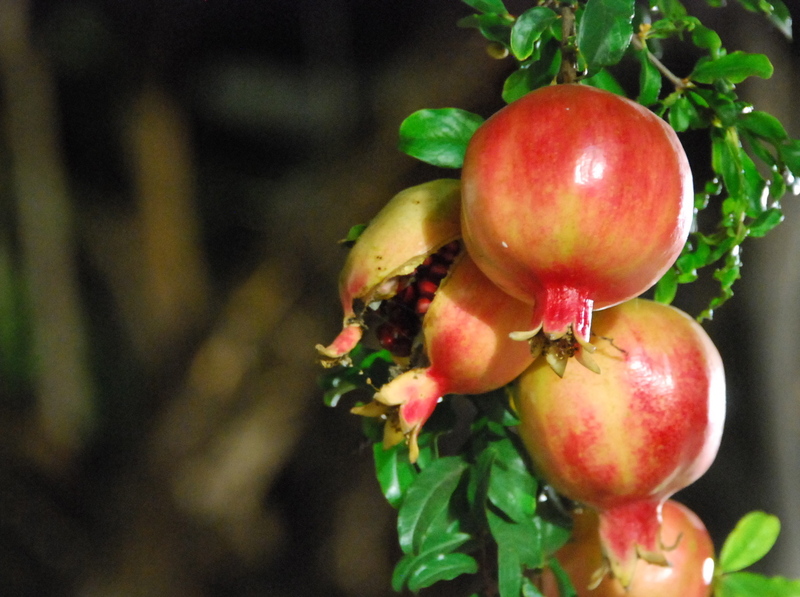 A huge pomegranate (las granadas) tree is laden with ripening fruit. 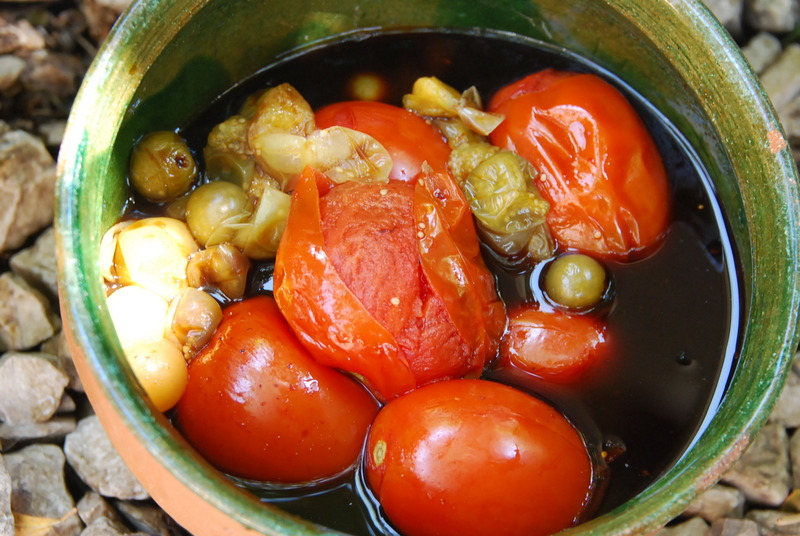 The fruit is suspended and hanging like Christmas ornaments, their color varying in shade from deep red to lime green, depending upon their maturity. 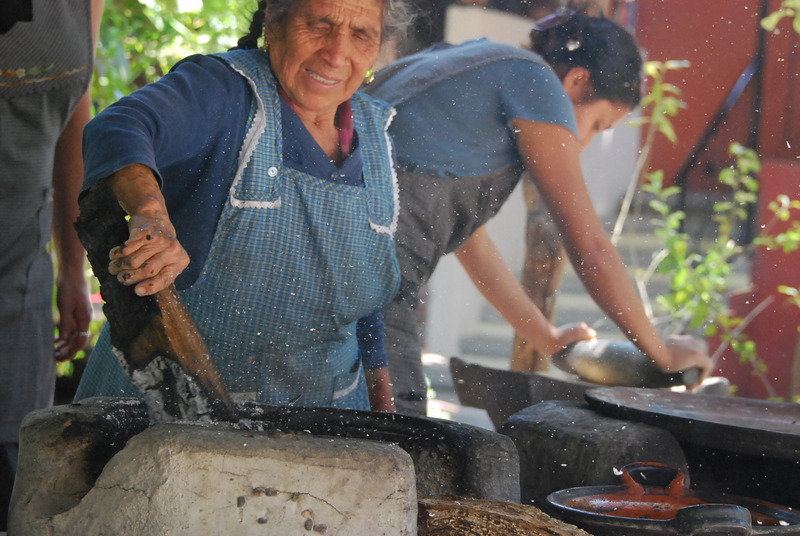 Grandmother Magdalena is at the comal, the outdoor cooking stove that is fueled with wood. This is her favorite spot in the entire family compound. 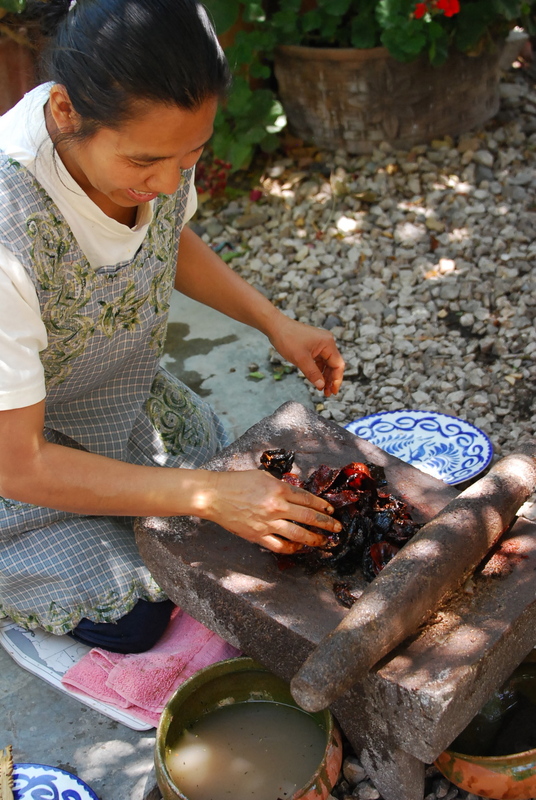 It is where she prepares the fire for making fresh tortillas and today she is stoking it to fuel the embers that will cook the mole rojo. 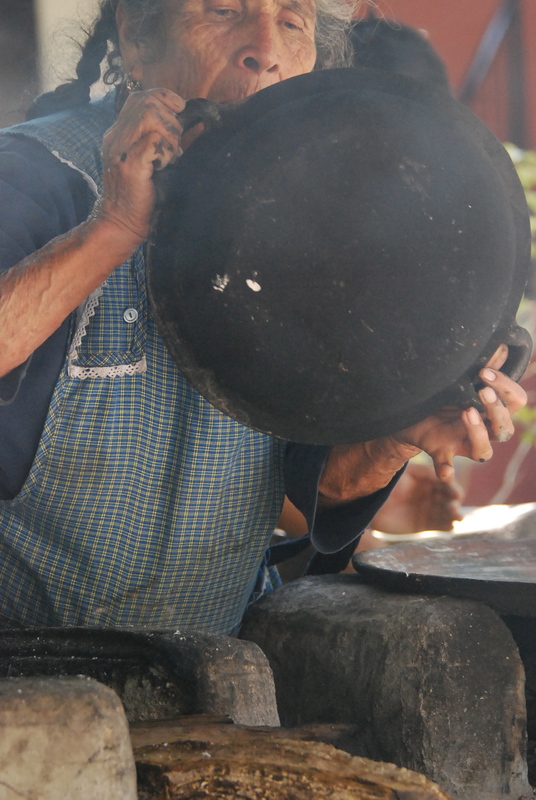 I have watched her preparing food at this comal for seven years and each time is a new experience. 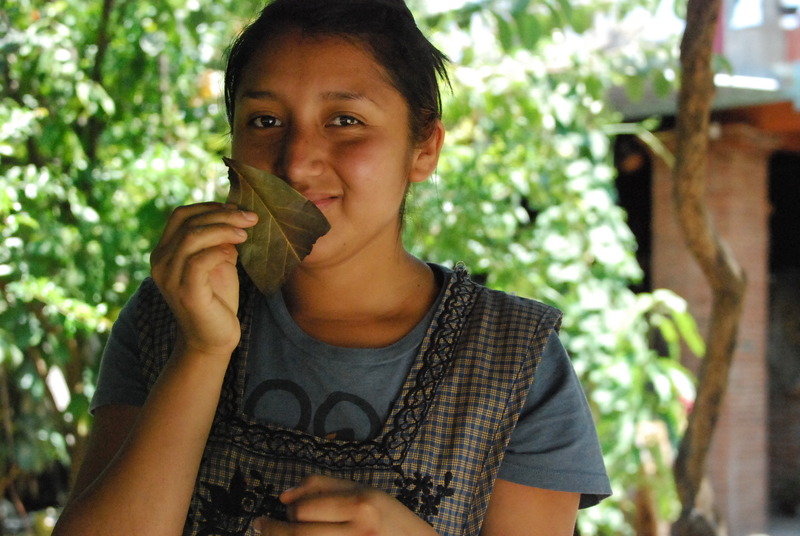 Magdalena’s granddaughter and Josefina’s daughter Eloisa is trained at the culinary school in Oaxaca. 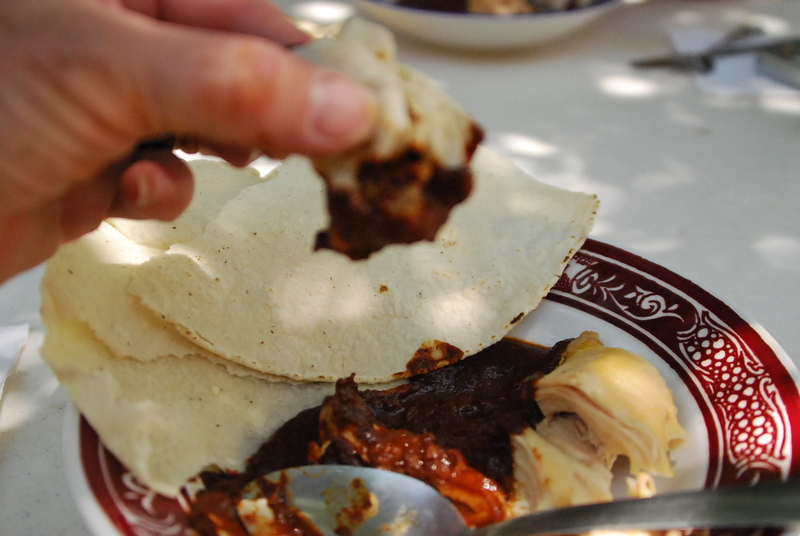 She says she likes this mole rojo recipe because the flavor is very special and part of her family’s tradition. 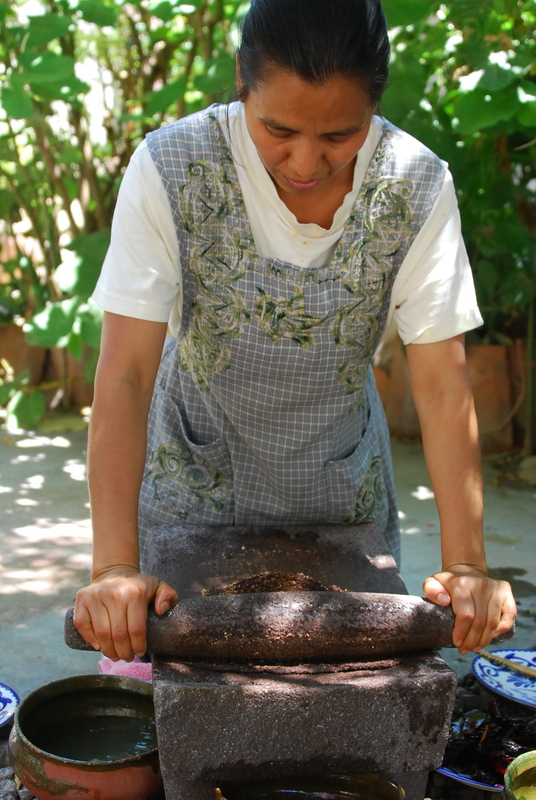 We smell the sesame seeds as Josefina kneels at the metate and incorporates the seeds into the chile paste. The paste is the a rich color of deep purple. 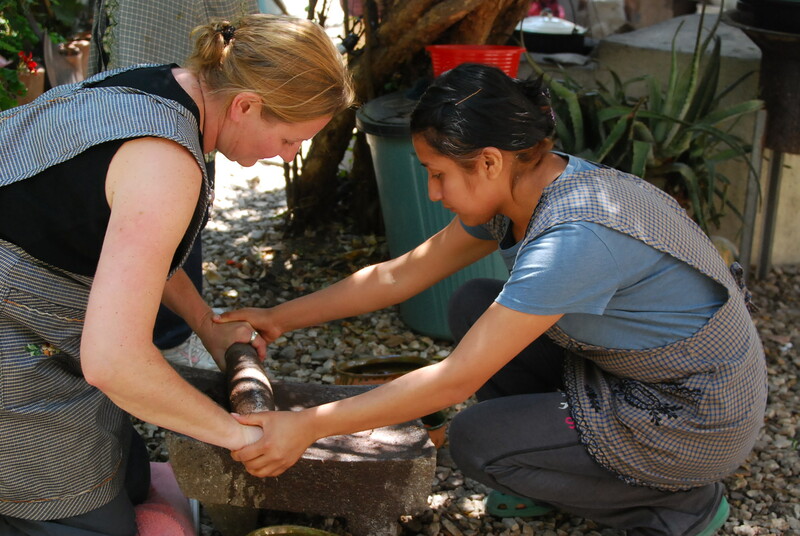 We take our turns at the metate, mano de metate in hand. 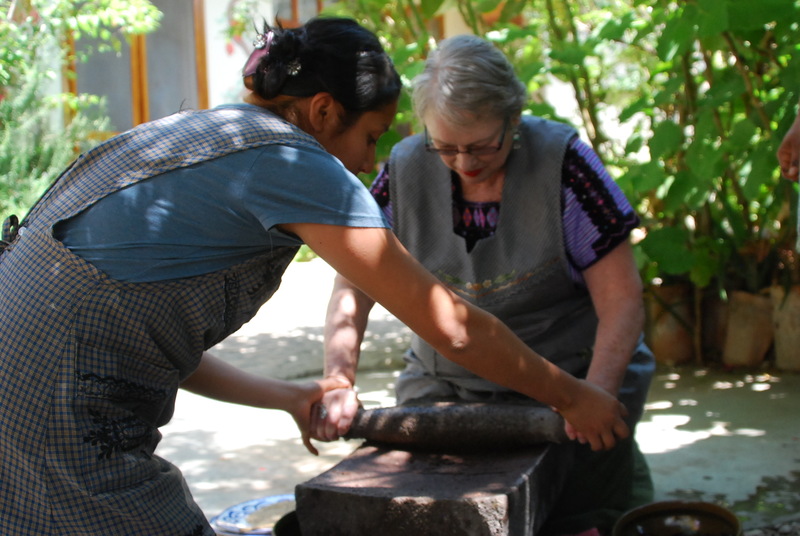 Pushing the mano de metate requires rhythm, strength and endurance. 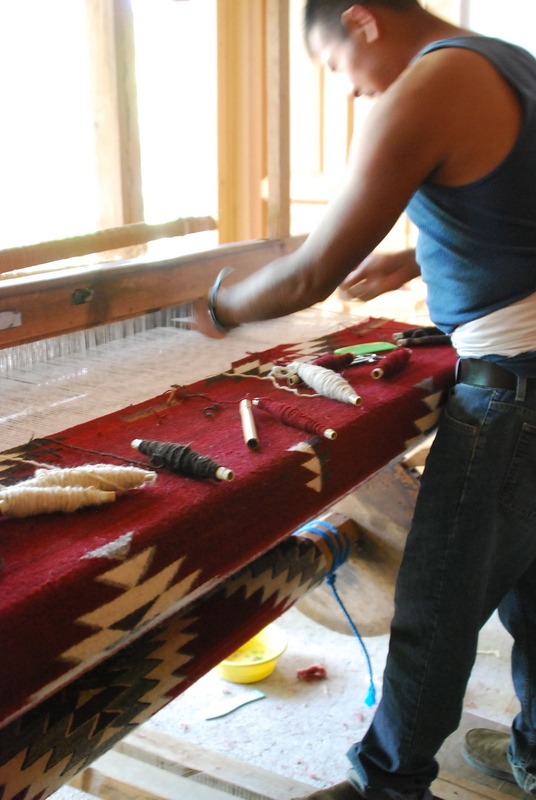 In the background, Eloisa’s husband Taurino is at the loom weaving a large floor rug. We hear the clapping rhythm of the harness and his weight on the two pedals, back and forth, back and forth. The loom beats to the rhythm of Ranchero music. 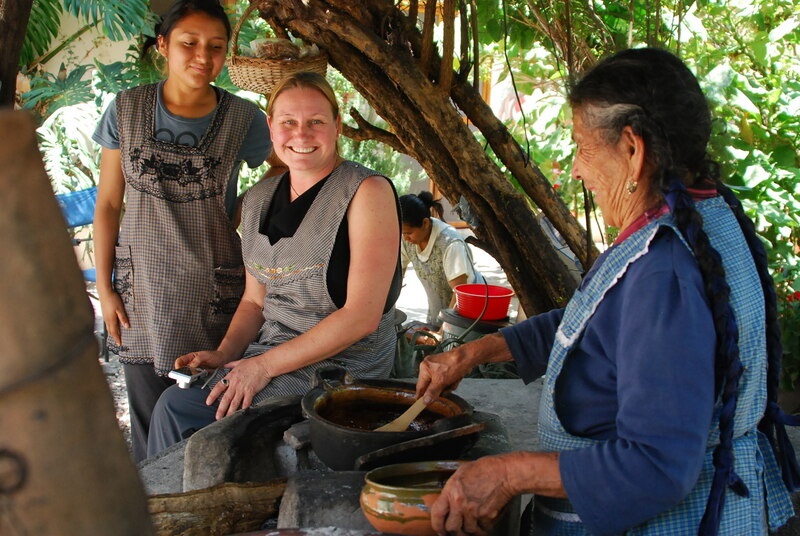 Zapotec is spoken between the three women. 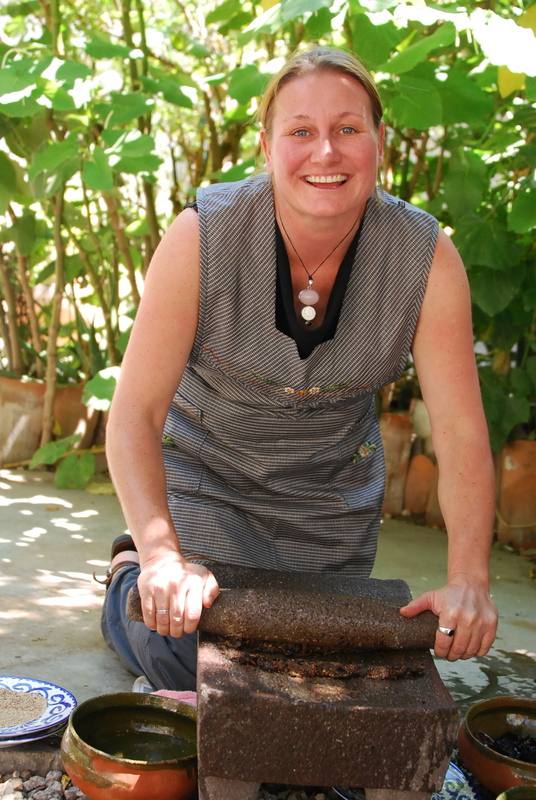 We are kneeling, trying to learn the rhythm of the ancient metate, used to “se muele”, to mash, crush, grind. The technique is not easy. Eloisa kneels beside me. Puts her hands on mine to guide the movement of wrists. She is twenty years old and experienced in these things. 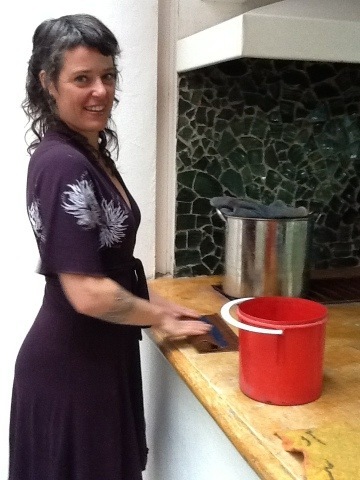 I push with my upper arms and body, leaning over the metate as I rotate my wrists in a small, rhythmic rocking motion. I feel the work of women over the centuries and know that the women I am with today are strong and will endure. They work beside each other, three generations, in harmony. Smell the smokiness, I note to myself. Absorb this moment. 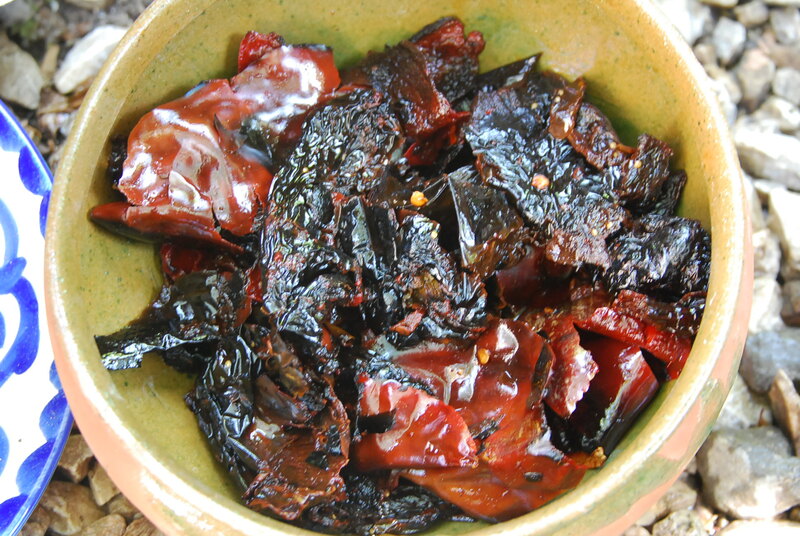 The chiles are smokey. The wood fire gives off the scent of earthy smoke. 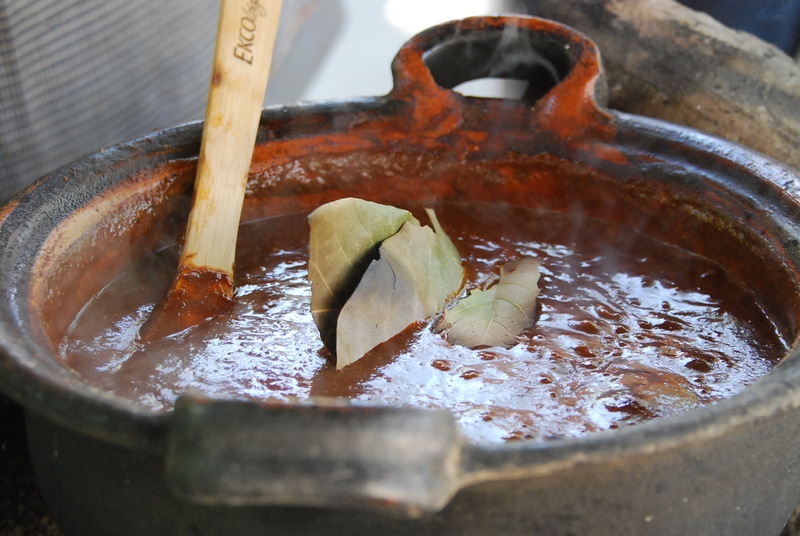 Feel the chile paste like clay. 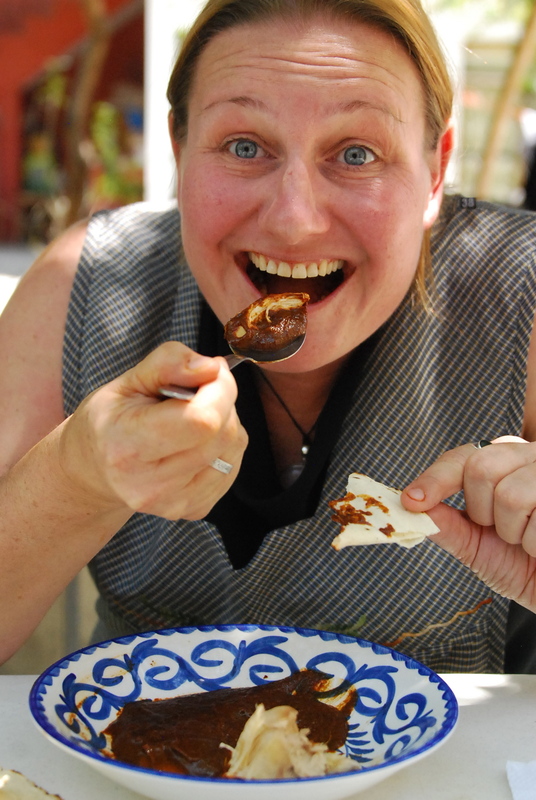 Josefina puts her finger to her mouth to taste the paste. Muy rico, she says. 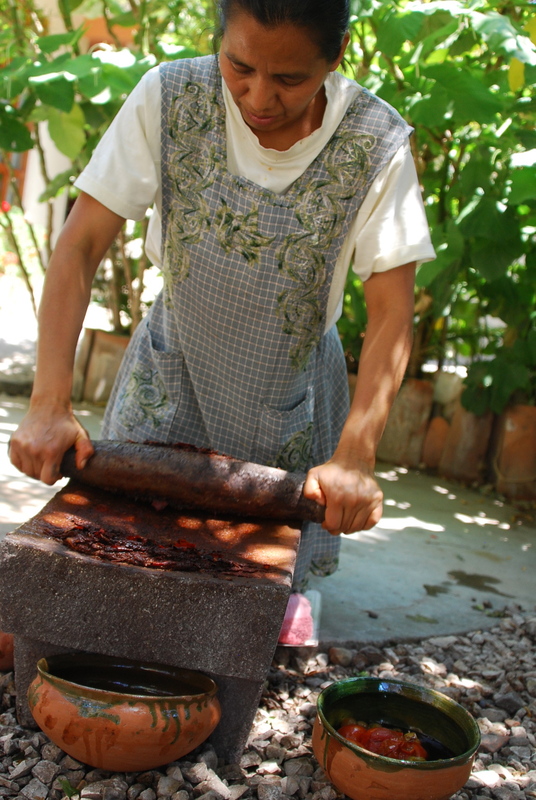 See Eloisa making bread crumbs on the metate. 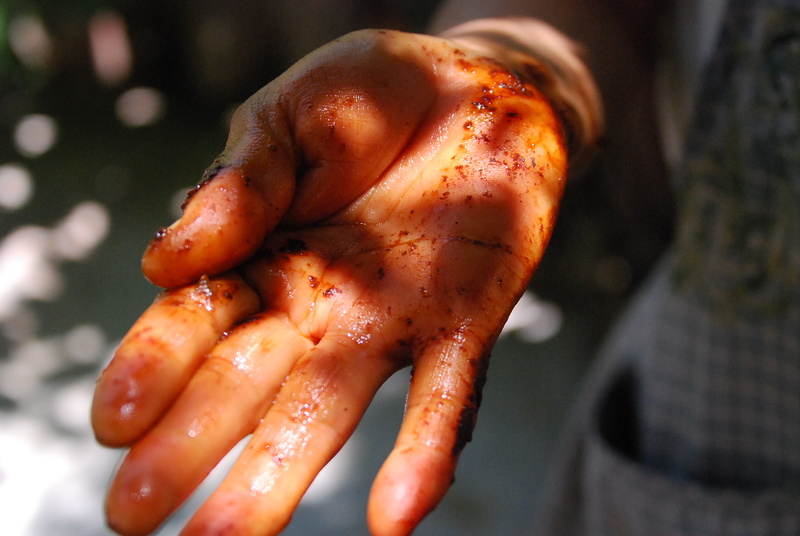 See Josefina’s hands red orange from the chile paste. 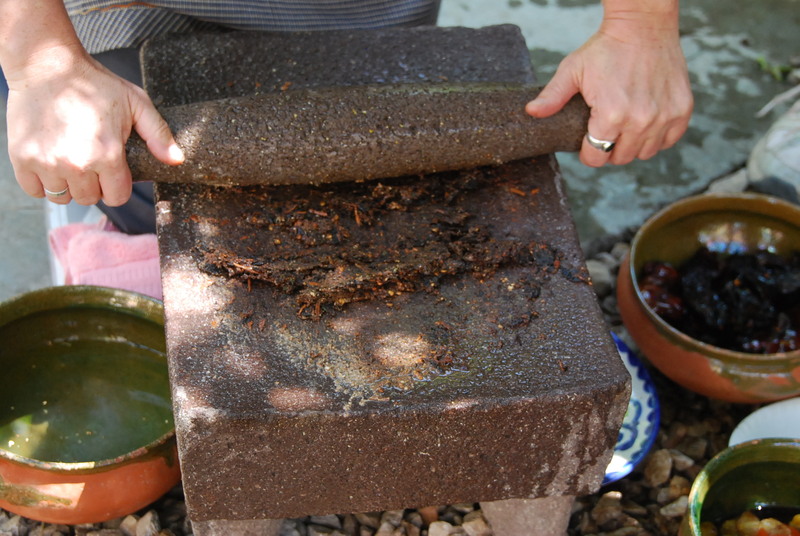 Hear the grind of the metate stone, stone of the river, piedra del rio. 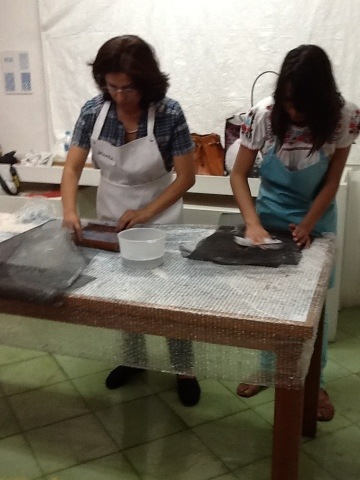 Josefina tells me it is not a commercial stone, but an ancient river stone, natural and shaped by an ancestor’s hand. 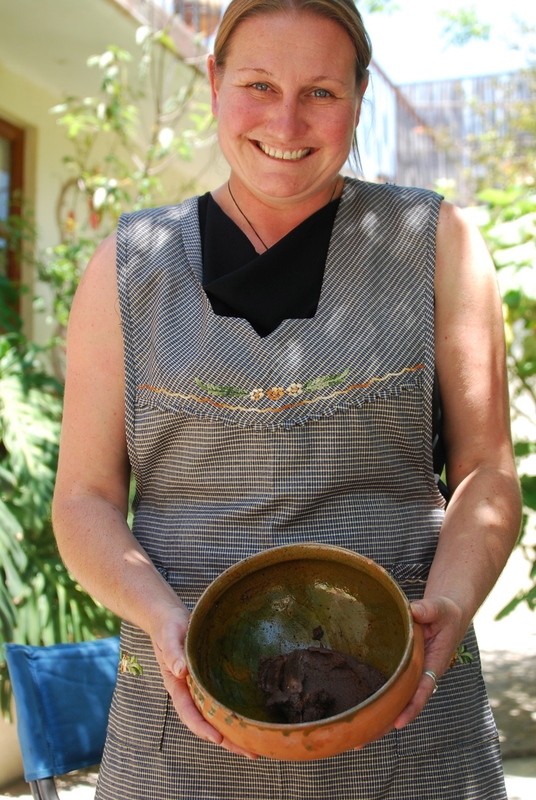 Watch Magda position the cazuela (casserole) on the comal. 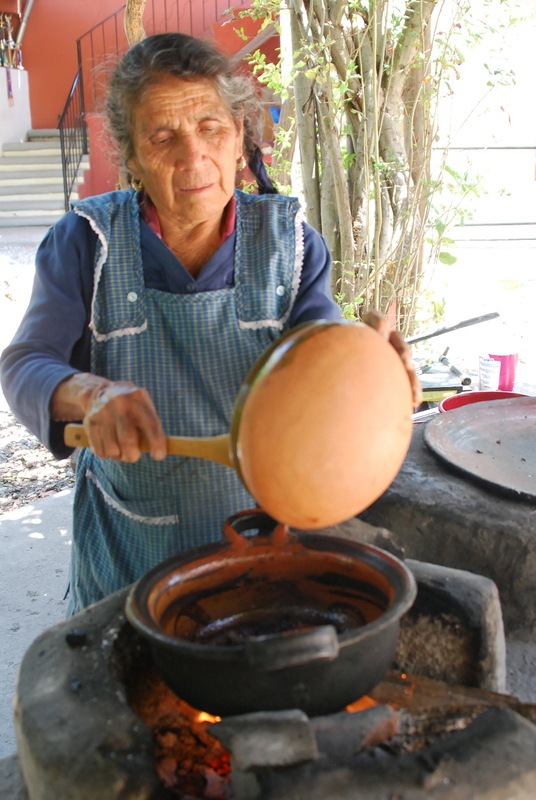 I yield to the tradition of making mole rojo and honor the women who feed the generations. Why? Last Friday a huge thunderstorm came through and lightening struck the Telmex box that provides Internet service to most of the village, including the house where I live. It is really difficult to write a blog post on an iPhone and the cost to use 3G here in Mexico is prohibitive. So please bear with me. We are waiting for service to be restored. There’s some administrative procedure needed that I don’t understand. Life is both easy and complicated here. Right now, I’m at a restaurant where my iPhone has WiFi but I can’t get my computer online. Which means no blog posts and no Skype. Aye yay yay. Postscript: I conquered it! Now online and ready to go again, reporting from El Descanso Restaurant in Teotitlan del Valle, at the corner of Avenida Benito Juarez and Hidalgo! 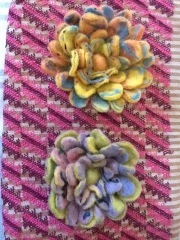 Textiles and fiber arts are the primary reason I landed in Oaxaca. 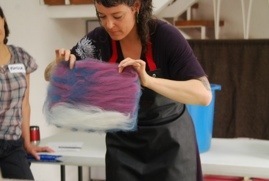 It started years ago when I learned to weave in San Francisco, California. 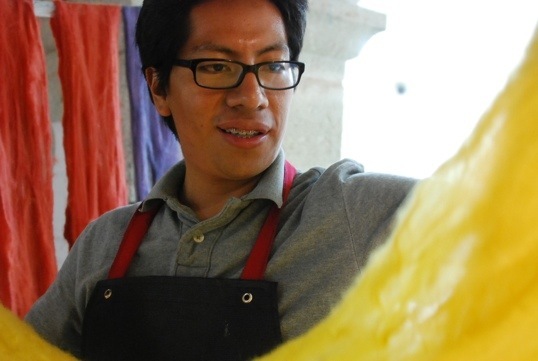 Now that I am here in Mexico almost full-time, I get to take advantage of the great workshops at the Museo Textil de Oaxaca organized by education director Eric Chavez Santiago. 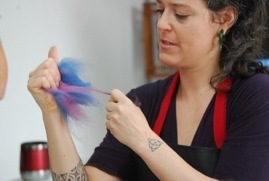 Yesterday was a felting workshop taught by Canadian designer and artist Jessica de Haas. 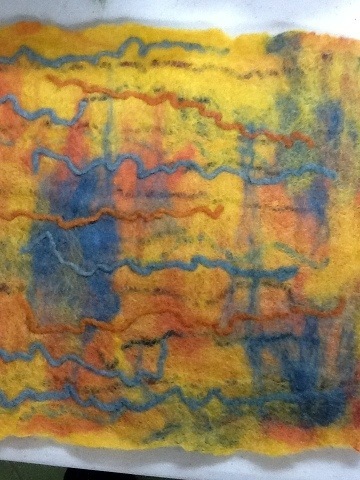 She makes incredible felted clothing. 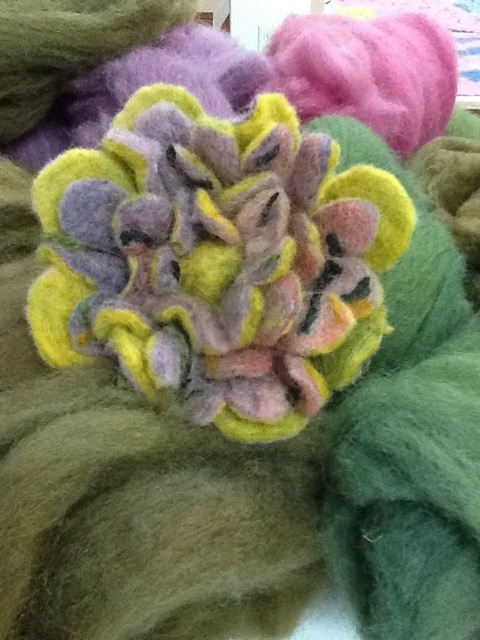 Our task was to felt a piece of fabric and make a flower. 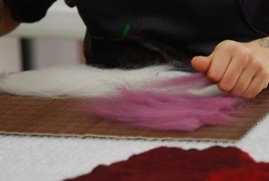 I was the only one with guts enough to cut into the felt I made. 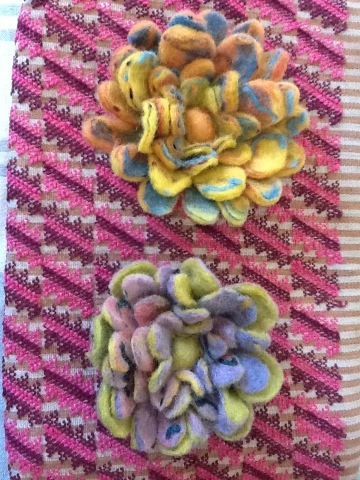 The result, two flowers to adorn a hat or collar or whatever! 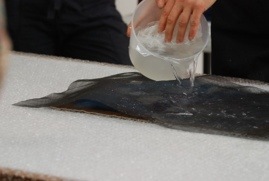 Jessica studied batik in Indonesia and has won numerous awards. 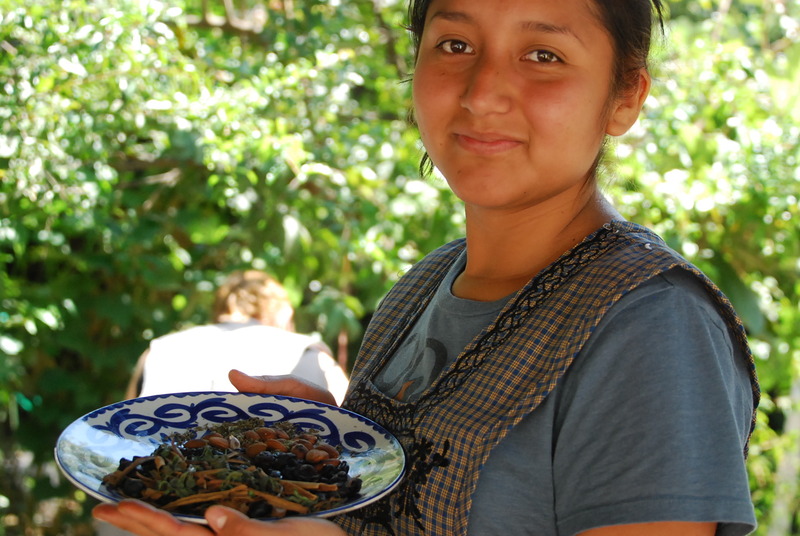 She is in Oaxaca for an artists residency sponsored by Foundation Archetopia. 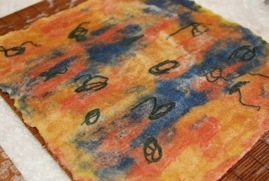 She will have a show of her work at the textile museum on April 13, 6 pm. She may even be convinced to sell some pieces! 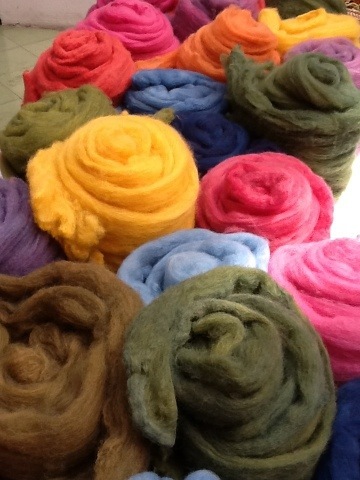 Felting wool is an ancient process that began in Mongolia. With a slide presentation to start, Jessica showed us the yurts, clothing, and blankets for humans and animals that originated there. She then showed us examples of her stunning work. 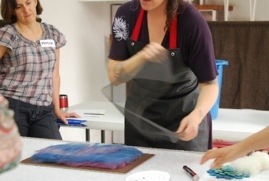 Jessica has a retail store, Funk Shui in Vancouver, BC where she sells felted clothing and shibori. 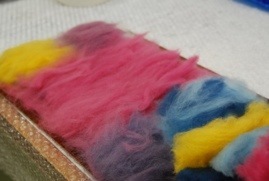 I’ll be posting more about the felt making process as soon as I can get back to my computer keyboard!